Few filmmakers have undergone the highs and lows of critical reception as much as M. Night Shyamalan. Praised as a young filmmaker for films such as The Sixth Sense (1999) and Unbreakable (2000) he has just as quickly seen his later works derided with efforts such as The Lady in the Water (2006) and The Last Airbender (2010). Devil (2010) is very much marketed as a Shyamalan production, even though he is not on directorial duties. The idea is for a new series of works where the story will be developed by Shyamalan before being given to another director to bring to the screen. The story in this case involves five people being trapped in an elevator. Oh and one of them happens to be the devil himself. It’s an Agatha Christie setup with a horror payoff. And for me it worked pretty well. It is not game changing stuff, but I thought it was an effective enough piece of high concept genre filmmaking. The film kicks off rather atmospherically with both an onscreen quote and a voiceover about the devil taking human form and walking upon earth. These early sequences show your usual establishing shots of a city, except that the image is inverted, conveying that there is something really off-kilter going on here. This effect is really engaging, because it is a lot more difficult to look away from than the usual standard establishing shots of this ilk. In fact the whole early section of this is really slick looking and uniquely shot. There are a lot of really swooping camera movements and a lot of dynamism from the camera in general. It is all over the shop in a great way. The really original camerawork continues in the lift at close quarters as it manages to convey the increasingly erratic state of those in the elevator as the tension ramps up. One thing that Devil definitely is not, is scary. Generally that would bring a horror film a fair way down, but strangely I still found myself really engaged. I think that perhaps it was a bit of wonder at where they were going to take this tale. How were they going to satisfyingly wrap up this tale of five folk and the devil in an elevator? And perhaps the ending actually does not even manage to do that, but going on the journey to see where it went was effective and enjoyable enough. Enhancing this is the fact that the movie is really well paced. It takes its time getting going, building back stories and mythology before plonking everyone in the lift. And builds the whole way through, ramping up the tension, slowly at first but getting faster and faster. The film is also helped by having some quite nice performances as well. Logan Marshall-Green who I know mainly from the TV show The O.C. is really good, as is Bojana Novakovic as another of the elevator inhabitants. Another reason the film was so successful for me is because it is so easy to imagine what a fucked up situation this is. Most people have a fair fear of getting stuck in an elevator. But imagine how much that fear is multiplied if all of a sudden the lights are flickering on and off and people are getting murdered in incredibly vicious ways. I think the film balances its narrative well too. 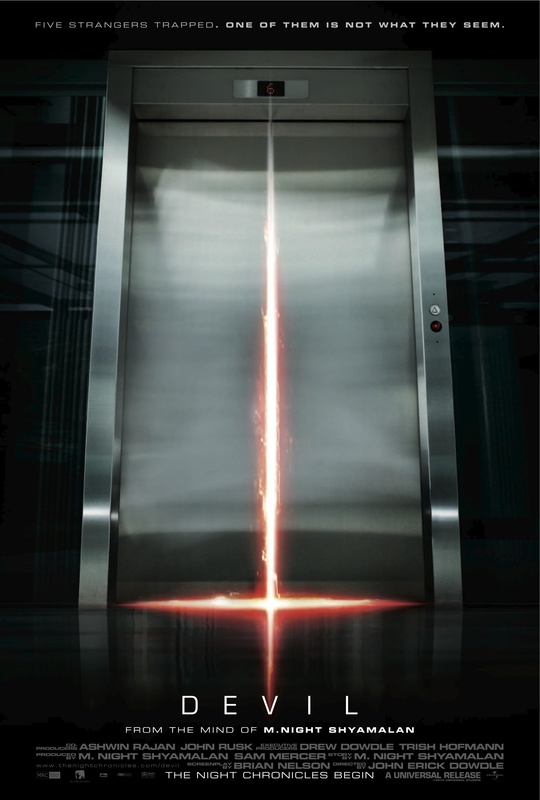 It might have gotten too intense or repetitive if the film tried to solely stay inside the elevator for the entire duration of the film. But there are welcome excursions outside the elevator car into the building’s security office and into the police investigation which make for a more engaging overall film. Devil was a really pleasant surprise for me. Perhaps I was just in a really good mood when I watched, but I thought that the fantastic simple premise was delivered on in a really engaging, if not perfect, way. I think this is one worth checking out. Cheers Mike and I agree totally with you. It is strange that it is a horror film that really is not scary yet is so engaging. Probably has something to do with the fantastic premise and the visuals that you mention. Cheers Tyson, glad to hear you are a fan. Nothing wrong with a bit of weird. I liked Devil a lot and it’s always good filler when there’s nothing else on! Good one! Thanks man, glad to hear you like it too. Yeah the ending did leave rather a little to be desired. haha, ya know, I actually like Lady in the Water, but, yes, it is frustrating to see Shyamalan’s back and forth since The Sixth Sense. Yeah that is fair enough. I didn’t have the same problem. For some reason, I have never gotten in to trying to guess ‘whodunnit’ so to speak. Which is weird, because I am a lover of crime fiction. Not sure why it is. Perhaps I am just really rubbish at it so pretend I don’t do it. Great review. I absolutely adore ‘enclosed-spaces’ films, because I love to observe all the group psychology and dynamics, its very interesting. This film provides just that. I liked it less than ‘Identity’, but there is something about lifts and emergencies which will always be fascinating to people. I also think that Chris Messina should be cast more in leading roles in high quality films, he is that good. I’m with you on the adoration of ‘enclosed space’ films. I just love it as a storytelling conceit. Do you have any other favourites in the genre (if it qualifies as a genre)? Identity, now there is a film I have not seen in years. I remember being pretty disturbed by it, but I saw it a long time ago. Will have to take another look. Cheers for sharing the list. I really enjoyed reading it and am definitely going to track down some of the films on there.